In a lengthy 1958 article for The Saturday Evening Post, Robert Yoder described the mood engineering of some 54 million Americans. A ‘subtle influence designed to alter their spirits’, prompting more efficient work and freer spending, had been carefully calculated and was executed so quietly ‘that the puppets never feel a thing’ (Yoder 1958, 31). The puppeteers claimed to change the public’s actions, words, and, Yoder presumed, their very thoughts. Having caught his readers’ attention, Yoder revealed this manipulative effluvium was the music playing gently in the background of most peoples’ lives. Yoder noted that the air was presently full of talk of ‘hidden persuasion’ infiltrating individuals’ minds. Background music, he claimed, was the original effort to subtly influence the moods and behaviors of millions. The substance of Yoder’s article focused on the behavioral psychology that framed the Muzak Corporation’s applied science as well as the psychiatrist Ira Altschuler’s theories of music therapy. The language of ‘hidden persuasion’ and ‘persuasion in the air’ is no doubt a nod to Vance Packard’s The Hidden Persuaders published the year before. In an era when Americans were prone to worry about the uses and abuses of psychology, Yoder’s humorous discussion of Americans’ willingness to accept behavioral manipulation as the price of happiness in consumer culture is one of the earliest indications of public ambivalence about the machinations of their soundscape. The headline and introduction to Yoder’s article for The Saturday Evening Post (6 December 1958). Robert Yoder was born in 1907 in Gibson City, Illinois and claimed to have run away to Chicago to become a reporter at the age of 16. Early in his career he worked for the Decatur Herald, the Chicago Bureau of the Associated Press, then the Chicago Daily News, taking over the ‘Sharps and Flats’ editorial column from Eugene Fields. In 1941 he began writing for The Saturday Evening Post, eventually becoming the Associate Editor for that newspaper as well as Woman’s Day. Yoder was best known for his humorous essays and was a great admirer of Groucho Marx and the radio personality Fred Allen. This admiration is apparent in Yoder’s absurdist, topically-oriented editorial columns. Yoder devoted an entire ‘Sharps and Flats’ column, for example, to a discussion of the fragments of annoying songs he found himself whistling while waiting for the elevator (Yoder, 1943). Because of the extensive circulations of The Saturday Evening Post and Woman’s Day, we can assume Yoder had a large, middle-class, mostly white audience. By Yoder’s telling, the mood-controlling effluvium could be heard in the great American factories of General Motors, General Mills Foods, at gas stations and the Bronx Zoo, the lobby of the Empire State Building, trains, planes, and even underwater at the swimming pool of Eaton’s Motel in Hamilton, Ohio. 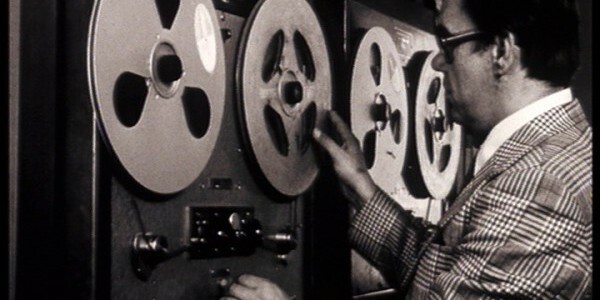 Yoder wryly described claims that background music took individuals’ minds off their personal troubles, increasing their contentment with work and life. It was both a stimulant and a tranquilizer. Yoder presented a fictional scenario in which background music prompted two co-workers to fall in love. Though individuals’ responses to the background music were involuntary, he did not find it underhanded. That is, the practice went on with the consent and approval of the listeners and, he continued, it made them happy. This limited the power of background music. As soon as the music annoyed a listener, it became a distraction and lost its power. Listeners seemed to know that the goal of the background music in their shops, restaurants, and workplaces was there to alter their moods and behaviors. The public knew what the background music was trying to do. The happy dopes were not naive. Indeed, the article itself is an early form of observational comedy, highlighting the absurdity of a familiar phenomenon. An image from Yoder’s 1958 article. 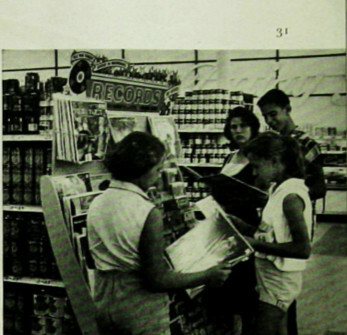 The caption reads: A music-filled atmosphere helps to put supermarket customers in a buying mood—not only for records but for groceries too. But was background music making listeners lose their authenticity? 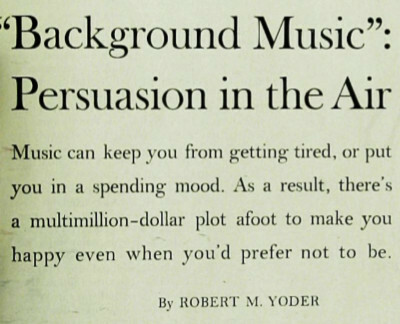 While Yoder argued that the persuasion in the air was consented do, he also described background music as ‘a multimillion-dollar plot afoot to make you happy even when you’d prefer not to be’ (Yoder, 1958, 31). This raises a question of authenticity. Yoder was perhaps implying that the persuaded cheeriness was not genuine. As wry and light as this article was, it reflects a more general concern about the mind and mood control. What if you were happy ‘even when you’d prefer not to be’? Was that happiness less real? It seemed to matter that this happiness was being created for a reason (to make the individual work or shop better). And though background music was a multimillion-dollar industry, was it, in turn devaluing music by making it functional? A 1959 brochure for Muzak. 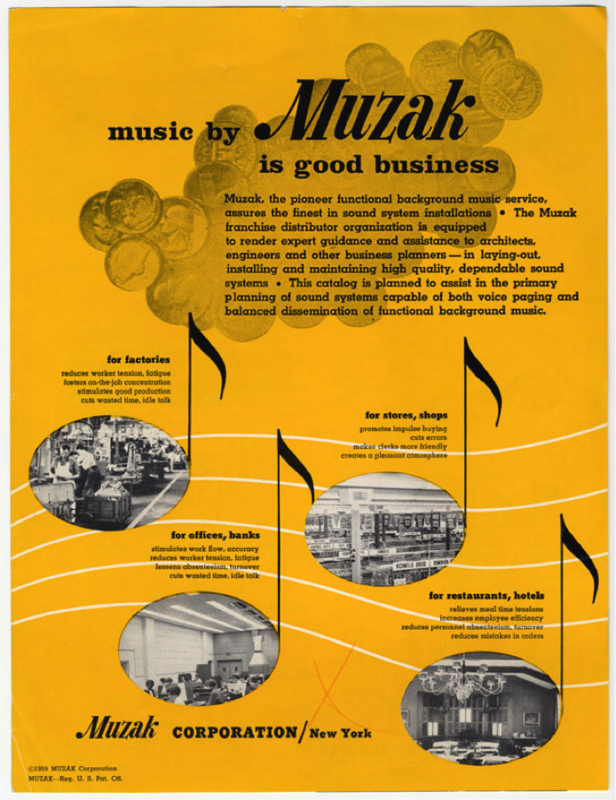 Some readers might be surprised to hear that Muzak was a company and not just a type of music. The company began in 1922 as an alternative technology that delivered music to private homes via electric wires rather than radio signal. The company, Wired Radio, Inc. changed its name to Muzak as a jazzy combination of ‘music’ and ‘Kodak’, another innovative company at the time, in 1934. At this time, the business model was altered to provide music to businesses. Yoder’s breezy article is one of the earliest examples of popular ambivalence about background music. Yoder saw numb, barely-conscious behavior elicited by background music being elevated and celebrated; it had become a desirable state. Happy blankness, he suggested, aided the free market. Both production and consumption went more smoothly with ‘Jeepers Creepers’ bopping along in the background. And sound was the means by which the persuasion of the masses was executed. Yoder explained that humans were helplessly susceptible to music and therefore helplessly susceptible to the machinations of the experiment-based capitalist schemes of background music. On the one hand, Yoder seemed to believe that it was pretty harmless: It made people happy. At the same time, this happiness was not quite real. Within a decade, public opinion would shift and presently background music is shorthand for tackiness. It is the thing we love to hate, in spite of — because of? — its ubiquity. We can read Yoder’s work as a whimsical, but telling, comment on Americans’ anxieties about mind and body control during the Cold War era. The breezy discussion of waking unconsciousness, of behavioral and functional psychology folded into corporate marketing strategies suggests that the readers of The Saturday Evening Post were familiar with such things. This was not an exposé. Humor — especially wry humor like Yoder’s — is often used to bring attention to the banal. Yoder’s portrait of background music’s zonked-out, cheery listeners was, just slightly more extreme than reality. Like all good observational comedy, this portrait prompted readers to consider just how strange reality had become. Background music was both untenable and entirely familiar. Hui, Alexandra, ‘Lost: Thomas Edison’s Mood Music Found: New Ways of Listening’, Endeavour, 38 (2014):139-142. Hui, Alexandra, ‘”Muzak-While-You-Work”: Programming Music for Industry, 1919-1948’, Historische Anthropologie, 22 (2014):364-383. Hui, Alexandra, ‘First Re-Creations: Phonographs and New Cultures of Listening at the Beginning of the Twentieth Century’, in Christian Thorau and Hansjakob Ziemer, eds., The Handbook of Music Listening in the 19th and 20th Centuries (Oxford University Press, 2017). Kennaway, James, Bad Vibrations: The History of the Idea of Music as Cause of Disease (Ashgate Publishing, 2012). Yoder, Robert, ‘Sharps and Flats’, Chicago Daily News (1943), referred to in The Billboard, December 4, 1943. 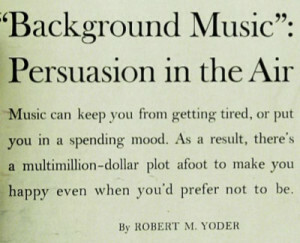 Yoder, Robert, ‘”Background Music”: Persuasion in the Air’, The Saturday Evening Post, December 6, 1958, p. 31, 84-86. Alexandra Hui is an Associate Professor of History at Mississippi State University, and author of The Psychophysical Ear: Musical Experiments, Experimental Sounds, 1840-1910 (MIT Press 2012). She is currently working on a scholarly monograph exploring the history of the science of background music. We might trace this concern back to the nineteenth-century fears of the physical and psychological toll of overstimulation caused by, say, Wagnerian music, described in James Kennaway’s Bad Vibrations: The History of the Idea of Music as a Cause of Disease (Farnham: Ashgate, 2012). November 20, 1920 Letter from Maxwell to Edison, William Maxwell Files, Thomas Edison National Historic Park.